The undergraduate Asian American Studies Program, housed under the School of Interdisciplinary Studies at Purdue, offers students the opportunity to pursue a minor in Asian American Studies. While the program focuses on the complex history of individuals of Asian ancestry living in the United States, it also provides students a perspective on the transnational and global linkages embedded within the Asian American experience. The Asian American Studies program provides students a way to expand their understanding of issues such as racial history, identity, gender, social justice/anti-racist movements, community and coalition building, etc. Furthermore, the program aims to reveal the relantionship of the Asian American experience not only to the development of the United States and its racial consciousness/identity, but also to other marginalized communities. As an interdisciplinary minor, it encourages students to pursue Asian American-related issues within fields such as sociology, history, literature, political science, film, and art. The Asian American Studies Program also sponsors lectures, readings, and events, and has worked in the past to help develop the Asian American and Asian Resource and Cultural Center (AAARCC) at Purdue. The Council on Asian American Studies established the Asian American Studies Program and minor in 2007. 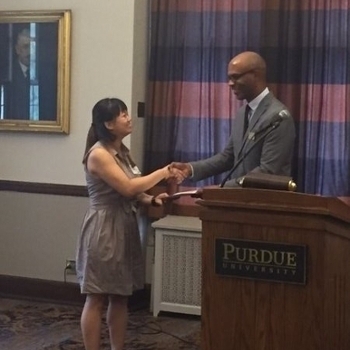 Nadia Arzberger, Senior in the Anthropology program at Purdue, was awarded the 2016 Outstanding Senior Award for Asian American Studies minors! A top student in each of her ASAM courses, Nadia was also engaged in community activities aimed at applying and extending the work she did in the classroom. Arzberger and her sisters of Omega Phi Chi Multicultural Sorority organized and ran an event last fall called "Her Many Faces," which brought together a panel of faculty and staff to discuss the experience of minority women on Purdue's campus and the larger community. We are proud to have Nadia as an Asian American Studies Minor, and congratulate her on her great work! The Asian American and Asian Resource and Cultural Center (AAARCC) is now open! Founded in January 2015 as a result of the dedicated efforts from students, faculty and staff spanning back through Purdue's history, the Asian American and Asian Resource and Cultural Center (AAARCC) joins the Black Cultural Center, Latino Cultural Center, Native American Educational and Cultural Center, and LGBTQ Center as an integral component in fostering a diverse and inclusive campus. We are working to build an archive to better construct the AAARCC's history and ensure detailed records are kept as we move forward. The Asian American Studies program at Purdue University is an institutional member of the CIC consortium of Asian American Studies programs. The CIC consists of the Big 10 plus the University of Chicago. The consortium promotes collaboration among the existing Asian American Studies programs and also brings visibility to the research and teaching at Midwestern institutions. For more information, visit the CIC Consortium website.